Read Rebecca Walker’s blog here on her website. 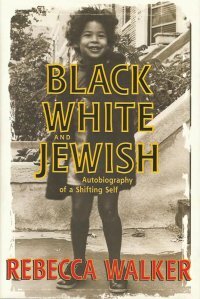 The daughter of Alice Walker and Mel Levanthal, Rebecca grew up between city and suburban neighborhoods after her parents divorced. She tries to negotiate her identity as she passes through these places, through different friends and lovers, and through others’ perception of who she should be. Her writing is so fluid, and accessible that it is very easy to place yourself in her narrative. I embraced the experiences she describes and felt the growth she writes about in adulthood. Walker is explicit about her feelings in every situation that deals with race; the reader must navigate the narrow path of mixed-ness with her, and is forced to understand. “I am a Movement Child. My parents tell me I can do anything, I can be anything I want. …I am not tragic” (24). “Bryan Katon, the boy that I like, tells me he doesn’t like black girls, and I think…I am, a black girl? I don’t know what I am and don’t know how to be not what he thinks I am” (69). “There is an awkwardness to my body, a lack of grace, as if the racial mix, the two sides comign together in my body have yet to reconcile” (255).